Today is the first of three blog posts about Chateau Rouge tea! Chateau Rouge is an independent gourmet food company, set-up in 2005. They are named after a legendary Parisian residence and inspired by the era of lavish banquets. 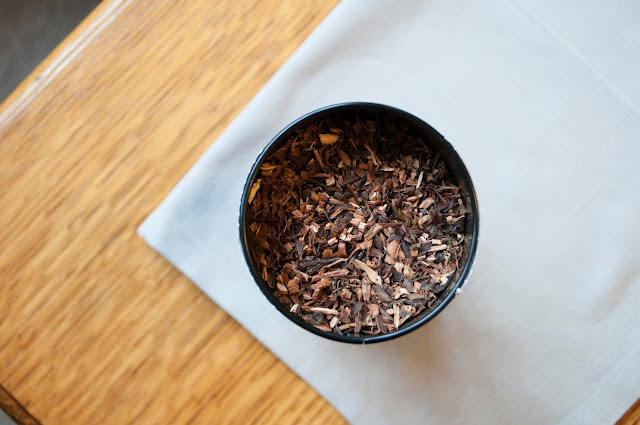 They have a range of speciality loose-leaf teas, blended and packed in England and I've enjoyed and blogged about Chateau Rouge's teas before. Today i'm excited to try their Organic Wildharvest Honeybush herbal tea! According to Chateau Rouge's website, each of their products has "its own heritage, authenticity and story of adventure and discovery." 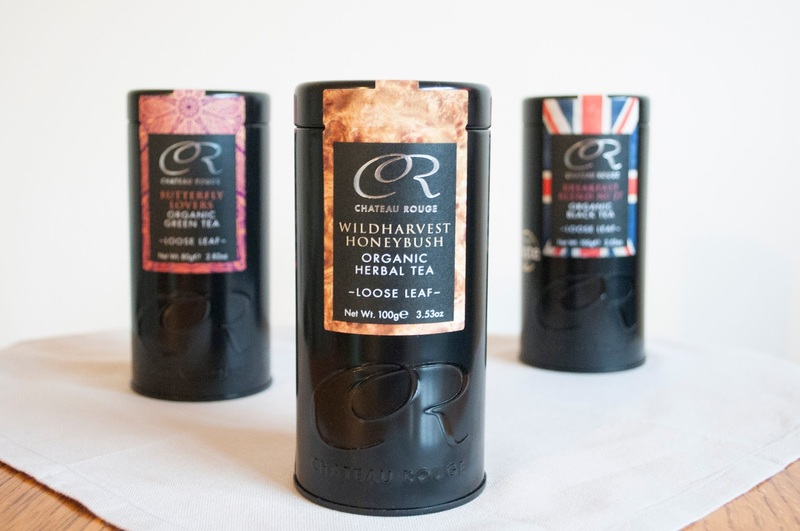 The Honeybush, also known as 'Cyclopia' is native to South Africa, and this tea is exclusively and sustainably handpicked for Chateau Rouge from wild bushes on steep, south-facing mountain slopes in the scenic Langkloof, Eastern Cape. The Honeybush is then "dried naturally in the sun and special course cut for a full flavour". After all that hard work, its final destination? My house. Great first impressions. This tea trio arrived individually wrapped in pink tissue paper and inside; Chateau Rouge's signature black tin. Last year, we actually bought one of Chateau Rouge's teas as a gift for a male friend as we like the modern, unisex design that appeals to all. Once you tear the seal on the recyclable tin, you see loose Honeybush tea as shown below without any extra plastic packaging, which is great. It's brewed for 3-5 minutes, but won't go bitter if it's left longer since this is tannin-free. I've used my glass teaware so I can appreciate the warm amber colour of this warming herbal tea. 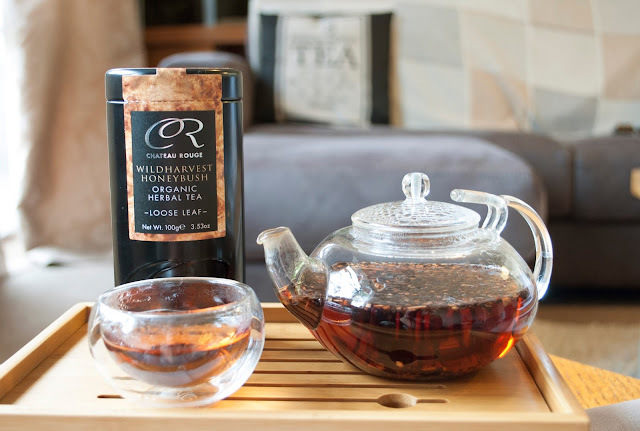 Being herbal, this is a caffeine-free infusion and the WildHarvest Honeybush is also high in antioxidants and minerals. Being organic this also means you consume the full-benefits without worrying about any pesky chemicals (woohoo!). Unlike some teas and tisanes, the flavour of this Honeybush is actually just like the aroma coming off it. It's called Honeybush as it has a naturally sweet honey flavour and is quite similar to Rooibos herbal tea. However, I feel that there's more body to this compared to Rooibos and strangely enough, it reminds me of some Earl Greys I've tried because it has quite a malty base. Quite a clever little herb considering there's no added ingredients like bergamot. I think there's a smokey wood flavour too, and I wondered if this was because the look of it reminds me of tiny wood chippings, but I closed my eyes and it still tasted the same! 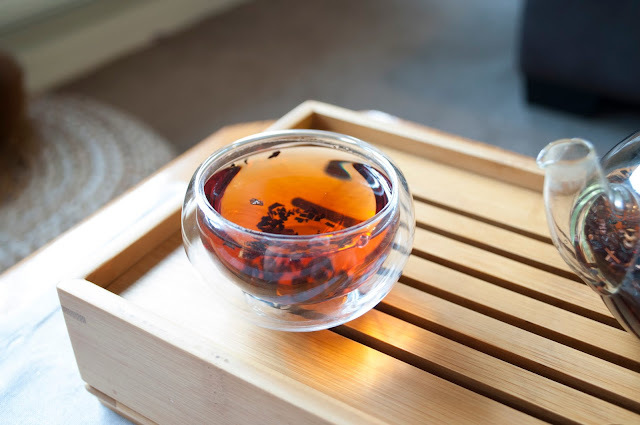 There's also a peppery and peach taste to it and all these little flavours make slurping this tea an interesting, mindful experience... How do you taste yours?